"The English have their trifle, Italians have tiramisu, and Latinos have pastel de tres leches, or three milk cake. 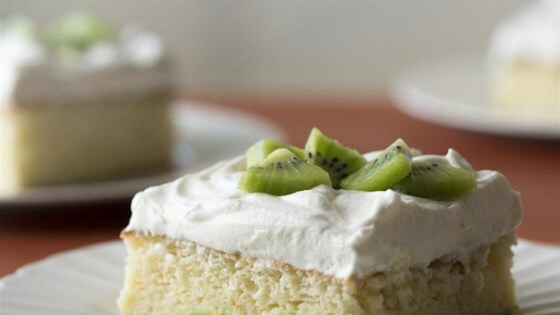 This scrumptious sponge cake absorbs its bath of sweetened condensed, evaporated and whole milk before being topped with whipped cream. Served with fresh fruit or as is, it's the perfect party dessert." Mix together flour, baking powder, and salt in a bowl. Stir together 1/2 cup milk with 1 teaspoon vanilla in a glass measuring cup. Beat egg whites with an electric mixer on medium-high speed until soft peaks form. With mixer running, add 1 cup sugar, 1 tablespoon at a time, and beat until whites are very stiff but still glossy, about 8 minutes. With mixer on low, add yolks, 1 egg at a time, beating until combined. Add flour mixture, 2 tablespoons at a time, alternating with milk mixture just until batter is smooth (be careful not to beat so much it deflates). Pour batter into prepared pan and bake in middle of oven until a toothpick inserted into center comes out clean, 27 to 30 minutes. Cool cake 30 minutes in pan on a rack (it will shrink), then invert onto rack to cool completely. When cooled, return cake to baking pan. Poke holes all over cake with fork. Stir together condensed milk, evaporated milk, and remaining 1/2 cup whole milk, and pour over cake. When cake absorbs milk mixture, 5 to 10 minutes, cover pan with plastic wrap and chill at least 2 hours or up to 8 hours. Whip heavy cream with remaining 1/4 cup sugar and remaining teaspoon vanilla with electric mixer on medium speed until stiff, then spread evenly over cake. Serve as is or top with fresh fruit. No changes. Definitely would make it again. I made this cake and waited for 3 days before we ate it. OMG is this good! Everyone wants the recipe and when they say that the cake gets better with age, it really does. Definitely a keeper. By all accounts, it was perfect! Very easy to make. I will make a bit more of the milk mixture next time as my sponge cake absorbed every drop. I’ll definitely make it again. Absolutely yummy. My 5 year old daughter helped and loved it too! Creamy and soaked wonderfully! i used baking soda and it tastes great. I followed this recipe exactly and it was delicious. Shared it with many friends and they agreed.